This Dulce de leche recipe is made with 1 ingredient in the slow cooker! It’s a super easy recipe to make and the results are a rich and sticky golden sauce you’ll want to put on everything! Dulce de leche sounds like something that would be hard to make, doesn’t it? But did you know this thick and delicious confection can be made with just one ingredient? That’s right! ONE! And it can also be made in the slow cooker, which means it’s a super easy and super hand-off recipe which yields amazingly gooey results! I promise you’ll want to put this on everything! I use this recipe in my Banoffee Pie because it’s an easy and delicious stand-in for traditional toffee/caramel. And honestly, it’s still so delicious that no one will know the difference! 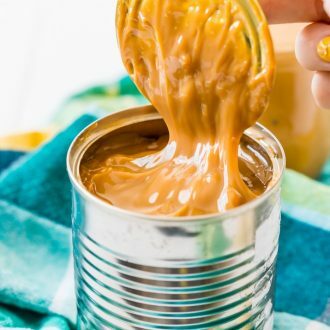 What’s the difference between Caramel and Dulce de leche? They are very similar in flavor, texture, and color, but are actually made from different ingredients. 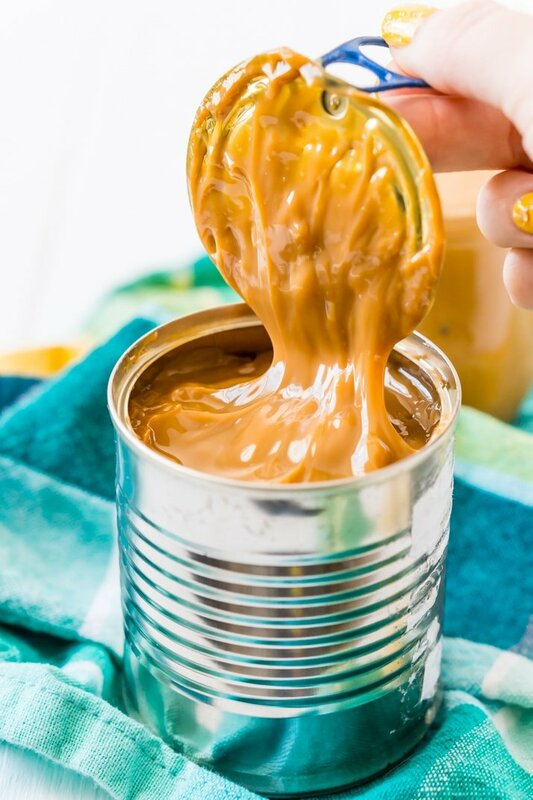 Caramel is made from water and sugar and Dulce de leche is made from milk and sugar or in this case, sweetened condensed milk. I tend to use them interchangeably in my recipes because I’m awful at making caramel, but anyone can make Dulce de leche with this recipe! How Do You Make Dulce de leche? You’ll find this recipe easy because it doesn’t require a candy thermometer or even a lot of attention. You simply add the can(s) of sweetened condensed milk to the slow cooker, cover with water, cook on low for 8 to 10 hours, transfer to a bowl of cold water and you’re done! Many often think of this sauce as being a Mexican specialty, but did you know it’s actually from South America, originating somewhere in Brazil, Argentina, or Chile? However, there is a Mexican variation known as Cajeta which is made with goat’s milk and vanilla. Want a Salted Caramel? Just add sea salt to taste! Want more of a Cajeta? Just add a touch of vanilla bean paste or extract! Want a bit of chocolate? Try mixing in some cocoa powder, chocolate extract, or melted chocolate to reach your desired flavor. Want a boozy touch? Try stirring in a few tablespoons of bourbon until your taste preferences are met! Even though this is a really easy recipe, you need to make sure to follow the directions exactly or it does pose some risk of your can exploding, so here are the musts to make sure you avoid that sticky mess! Make sure cans are sealed. Make sure the cans are placed on their sides in the slow cooker. Make sure the water is at least 2inches above the top of the can at all times, check every couple of hours to make sure it doesn’t need more added. Cook on low heat always, never high. When they are done cooking, use tongs to transfer them to a large bowl filled with cool water to bring them to room temperature before handling. 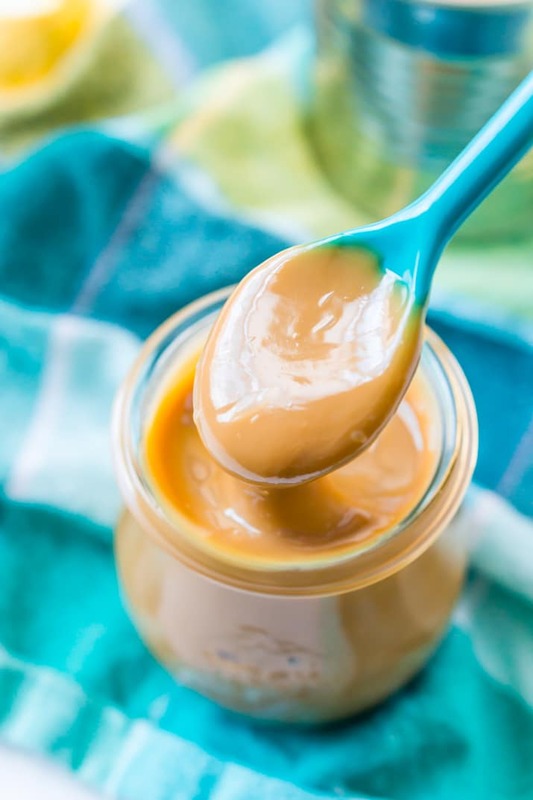 This Dulce de leche recipe is made with 1 ingredient in the slow cooker! It's a super easy recipe to make and the results are a rich and sticky golden sauce you'll want to put on everything! Place the can(s) of sweetened condensed milk on their sides in the slow cooker, you can leave the wrapper on, it won't hurt anything and will come off naturally during the cooking process. Add enough water to cover the cans by at least 2 inches, check periodically during the cooking process to ensure that the cans are always covered in water to prevent burning and combusting. Cook on low heat for 8 to 10 hours, the longer it cooks the darker the sauce will be. After the cans are done cooking, use tongs to transfer them to a large bowl filled with cold water, again making sure they are fully submerged, to bring them to room temperature. Let them sit for 10 to 15 minutes before handling and opening. Stir the sauce up and use it on anything and everything! Calories are calculated by the ounce in this recipe. Another reason to love my slow cooker!! Excellent instructions on how to make Dulce de Leche! 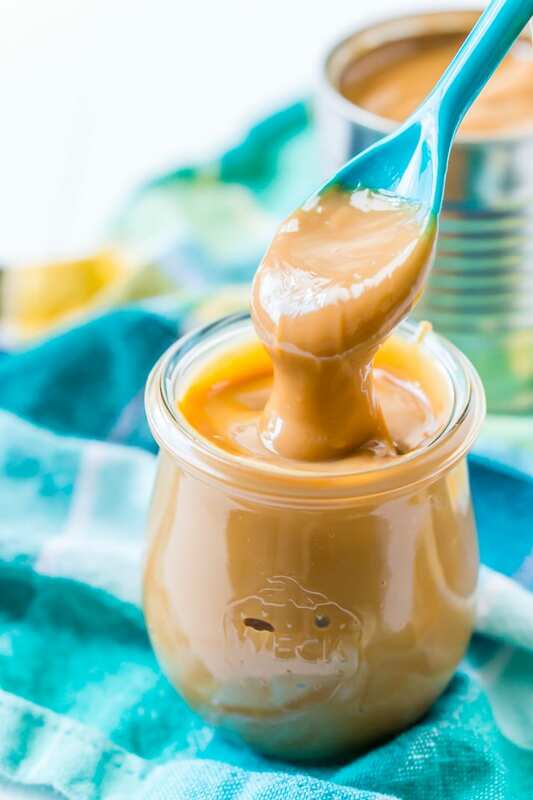 Thank you so much for including my Mexican Hot Dulce de Leche! You are so welcome, I can’t wait to make it with this sauce! How easy is this?! Pretty sure I need to try it on that salted caramel poke cake! I didn’t know this could be made in a slow cooker. My whole family are dulce de leche fanatics. Yes, you have to try this, they will all love it! This is genius! What a great technique to make dulce de leche, and so easy too!!! Can’t wait to try this. How do you store it afterwards? Hi Christine, I just store it in an air-tight container in the fridge.